Most of my world travel is virtual reality experienced through a screen. Downton Abbey took me across the pond last night. The show portrays a fictional estate in Yorkshire from an actual estate in Hampshire. My Banford and Nevin maternal ancestors emigrated from the confines of the Colebrook estate in County Fermanagh in Ulster. 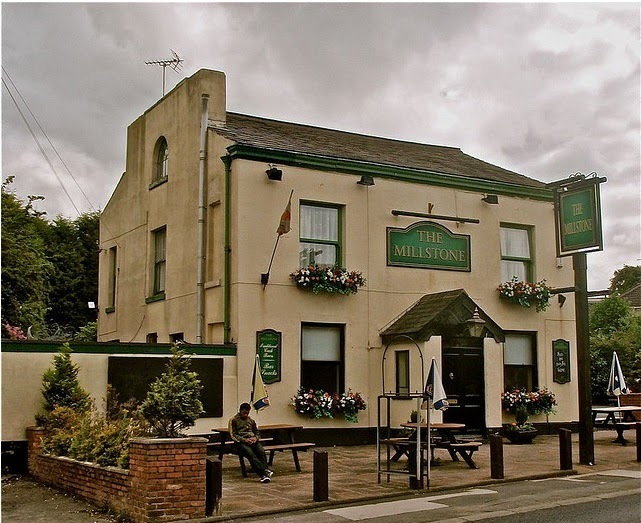 My paternal grandmother’s ancestor, James McCrory, left County Monaghan, Ireland, settled in Lancashire, England married an innkeeper’s daughter, Sarah Lee and took her to Pennsylvania. I have had the good fortune to retrace some of the steps of these ancestors with a visit to Ireland back in 2008. Our ancestors who emigrated from the United Kingdom and Ireland had an uneasy relationship with the lord of the manor. Now we marvel and dare I say idolize the grandeur of our former masters. I presented an overview of my British Isles research techniques to the Bear CreekGenealogical Society on Thursday. I took a “show of hands” survey and was pleased to see how many of the audience had, English, Irish, and Scottish forebearers. I was also somewhat amazed that the vast majority of the audience was following Downton Abbey. Why is this show so popular with Americans ranging from the 1% to the Occupy Movement? What are the implications for genealogy in America? To answer the first question, I recommend a most intriguing article posted by the History News Network at George Mason University. 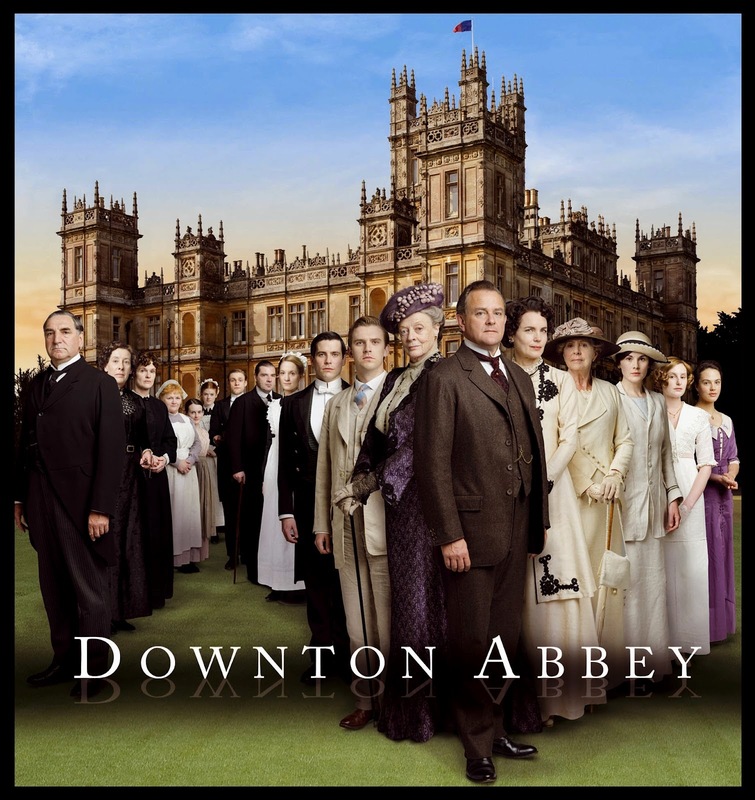 The article observes that the show features characters that appeal to our deepest American beliefs: “Downton allows people from across the socio-economic and political spectrum to see their values legitimized through the storytelling process.” And of course that castle and those costumes are a great escape from the routine of our urban and suburban lives. As a genealogist, I love the fact that Downton Abbey profiles the lives of the gentry, the tenant farmers and the servants. We can at least imagine what it was like for our ancestors to live in this tiered society that was manifested throughout the British Empire. Perhaps we can imagine why our ancestors supported a revolution in the American colonies. But the thing I love most about the lords of the manors are that they kept good records. I lured my wife to accompany me to Ireland with the promise of touring the Irish countryside. She was not surprised to learn that there was a family farm, church or cemetery at the end of every road. I also promised that we would see tourist attractions like the Book of Kells and the Giants Causeway. Being the ever patient wife of a genealogist, she shared some of my excitement when the archivists from the Public Record Office of Northern Ireland (PRONI) brought us the leases and survey maps in the form of the original hand drafted documents on sheepskin. We never made it to the Giants Causeway because of the five days spent at PRONI. We did make it to the bar at the top of the Dublin observation tower at the Guiness Brewery and we came home with some great pictures and souvenirs! 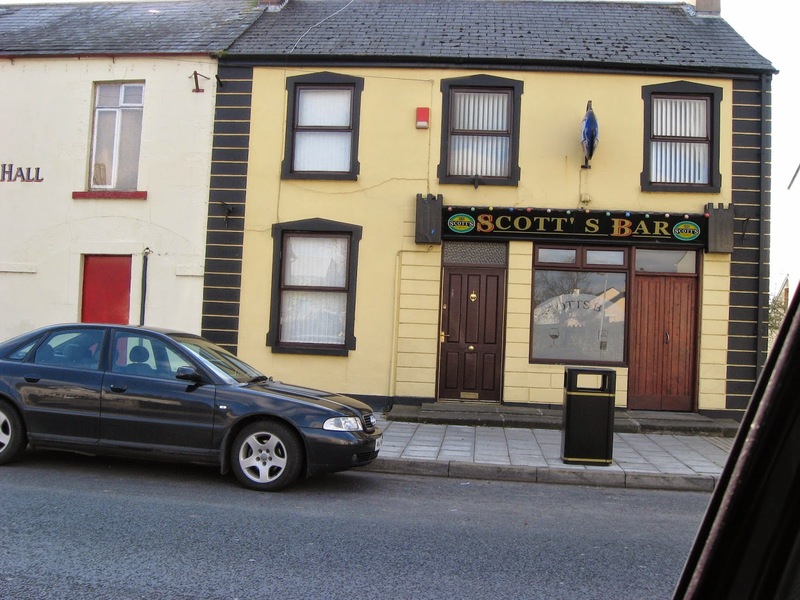 We introduced ourselves to the locals at Scott's Bar in Brookeborough, County Fermanagh. They took us to meet a woman who was the keeper of the Colebrooke Cemetery records. 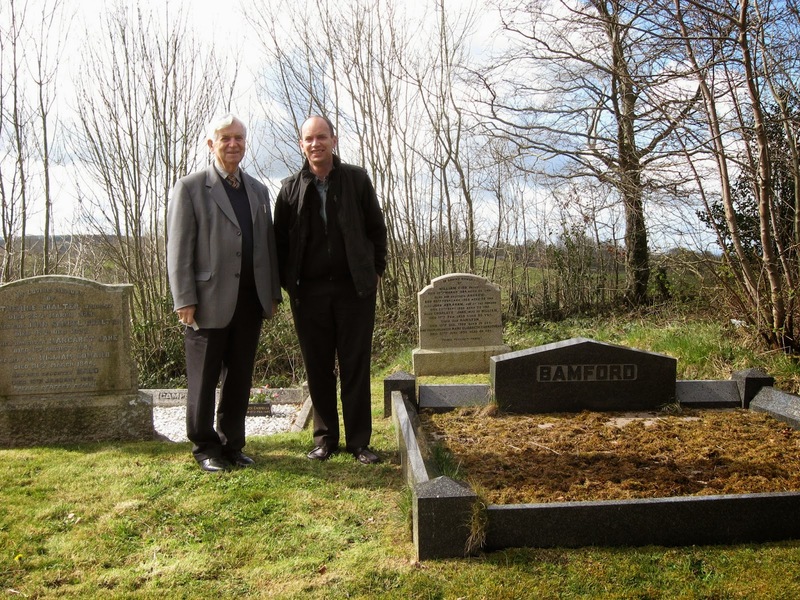 Bertie Morrow and Nick Cimino at Colebrooke Church Cemetery, April 2008. Bertie was a retired postman and volunteered to provide us a tour of numerous family history sites. His full name was Albert Nevin Morrow. We are both descendants of the Nevin family, tenant farmers on the Colebrooke Estate in the Rafintan Townland in County Fermanagh. 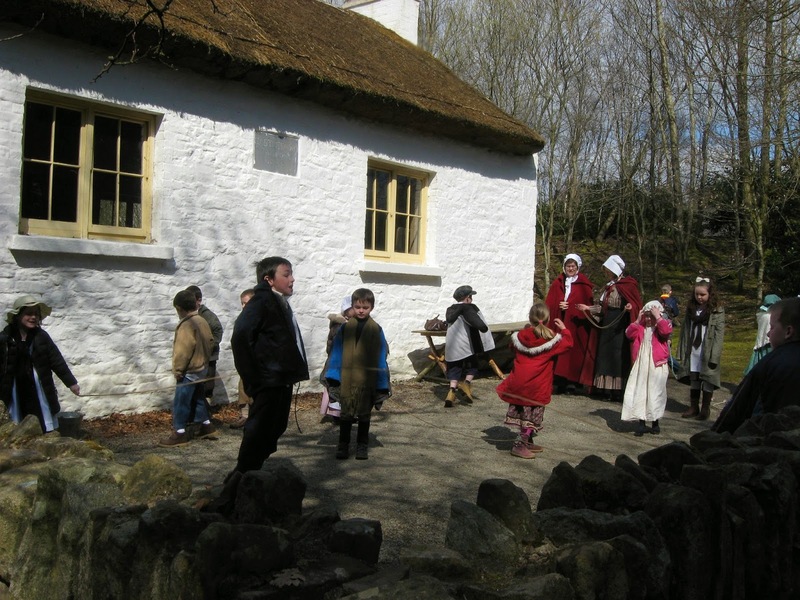 Children experiencing "living history" at the Ulster American Folk Park, Northern Ireland. We enjoyed visiting this hands-on demonstration of the lives of our ancestors. PRONI Reference Number: D998/26/295 : dated 29 Sep. 1812; Lease from Henry Brooke, Colebrooke, Co. Fermanagh, to Richard Neven and Thomas Neven, Rafintan, Co. Fermanagh, of 25a. 2r. 5p. of Rafintan, Co. Fermanagh, for the lives of Thomas Neven, lessee, aged about nineteen, Mathew Lucy son of Thomas Lucy of Dogary [Doogary] aged about nine years and Thomas Neven eldest son of Richard Neven one of the lessees aged about four years: (1) Rent £37 5s. 10d. ; (2) Thirty-seven days work of man and horse and thirty-seven fat hens or two shillings in lieu of each days work and fourpence in lieu of each hen; (3) Corn, etc, to be ground at mill of Henry Brooke, payment for not doing so £5; and, (4) Reserves right to make a road. 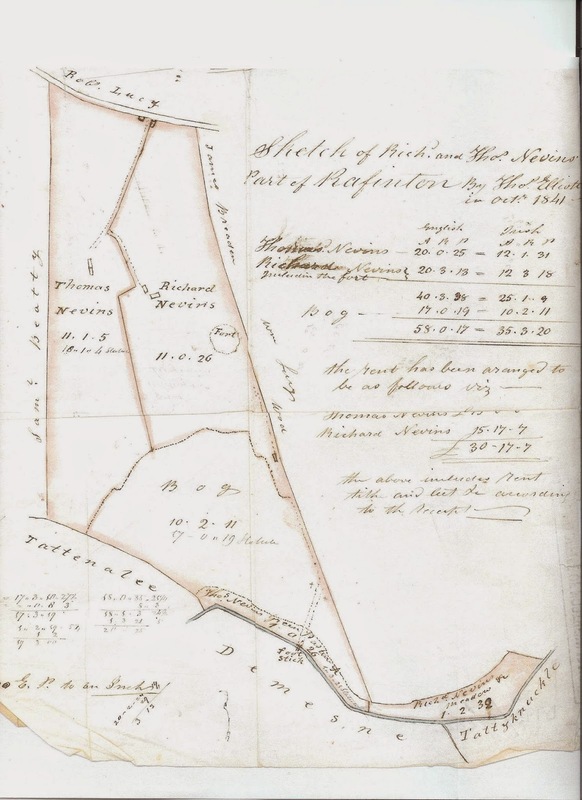 This 1841 sketch shows how the land was divided between Thomas and Richard Nevin. PRONI Reference Number: D998/26/606 : dated 15 Apr. 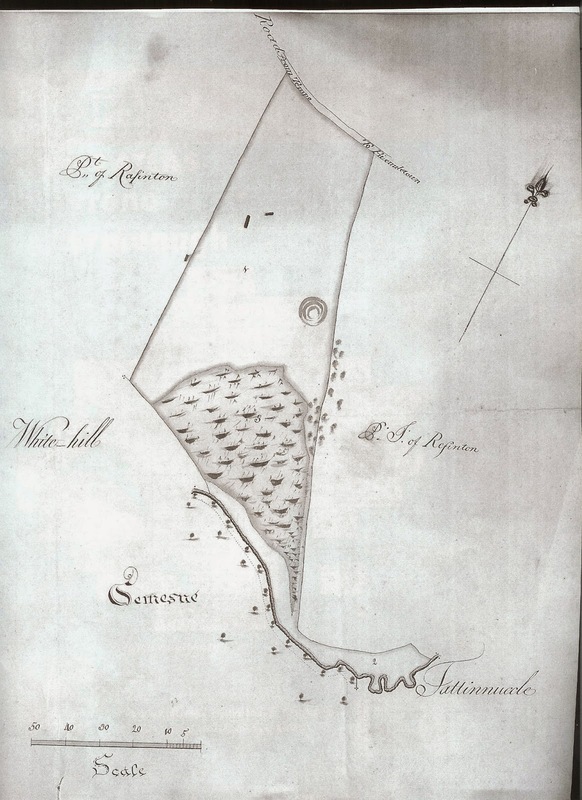 1841; Lease from Sir Arthur B. Brooke, Colebrooke, Co. Fermanagh, to Thomas Nevin, Rafintan, Co. Fermanagh, of 20 acres 25 perches of Rafintan, Co. Fermanagh, reserving 17 acres 19 perches of turf bog adjoining, for the lives of Henry Francis Brooke and Mathew James Burnside: (1) Reserves right to make a road; (2) Rent £15; (3) Seven days work of man and horse and fifteen hens or fifteen pence in lieu of each days work and sixpence in lieu of each hen; and, (4) Corn, etc, to be ground at mill of Sir Arthur B. Brooke, payment for not doing so £2. Courts, Leet. Courts, Baron.